Cuisinart Griddler Deluxe Just $111.84! Down From $300! PLUS FREE Shipping! You are here: Home / Great Deals / Amazon Deals / Cuisinart Griddler Deluxe Just $111.84! Down From $300! PLUS FREE Shipping! Don’t miss your chance! Amazon offers this Cuisinart Griddler Deluxe for only $111.84, down from $299.00, PLUS FREE shipping! 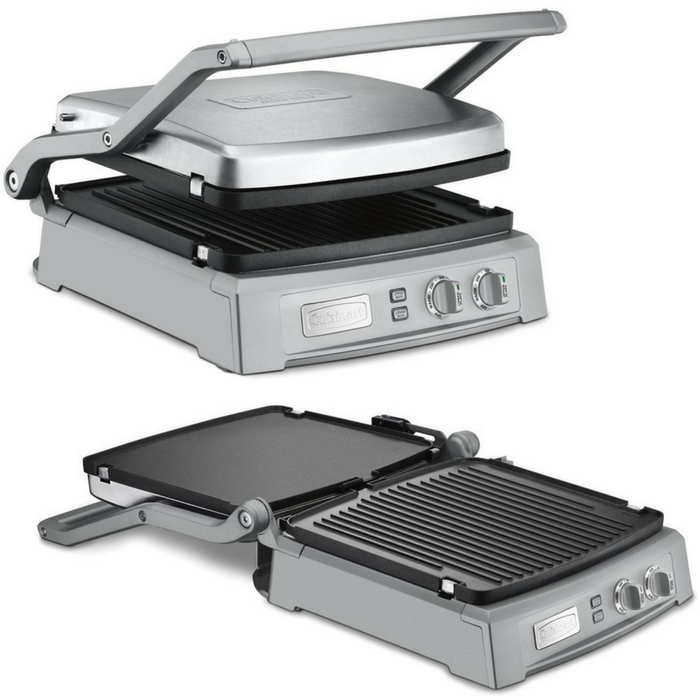 The Cuisinart Griddler Deluxe takes grilling to new heights! It offers six enticing cooking options. The reversible grill and griddle plates, combined with dual-zone temperature control, give home chefs complete control. This grill is perfect for making pancakes and eggs for breakfast, panini and open-faced sandwiches for lunch, and burgers or fajitas for dinner. The extra-large grilling surface is ideal for entertaining a crowd or making family meals. The new SearBlast feature locks in the flavor of steaks. With dishwasher-safe accessories, an elegant new look, and 1800 watts of power, deluxe is an understatement!